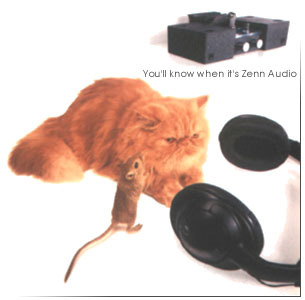 The Zenn audio component is a product that is the culmination of many years of experience in building customized equipment. The uniqueness of this product goes beyond its unusual and rather attractive appearance, which came about as a result of adherence to an elementary principle in dance theory- "form follows function". That is to say its unusual aesthetics follows its unique design principles and philosophy - the primary purpose of its creation was the reproduction of recorded music in a manner that is tonally correct, so as to create in the listener a sense of ease and relaxation. A unique circuit topology allows the 300B, which is normally used in the output stage of a poweramp, to be used as a preamp valve. This is to capture the midrange magic of this valve without being limited to 8 watts per channel, which is what the 300B valve capable of if used in a poweramp output stage. But used in the preamp stage the poweramp limitation is now in the poweramp of the user. This basic linestage preamp, though affordably priced, shares an identical linestage topology as the 5687 phono. It is designed to bring the digital medium closer to an analog sound. This preamp is designed for vinyl lovers which incorporates a high quality phono stage (2 pieces12AX7) in additon to a very musical linestage using a single 5687 valve. This poweramp combines the virtues of tubes and solid state in one package. It provides an ample 50watts rms with a valvelike tonality. Drivers are tubes and output are mosfets. Like all Zenn components the tube section derives its working power from a tube rectifier (6CA4) to ensure a smooth and transparent sound quality.